LTE networks are all-IP-based without a circuit switched domain, traditionally used to support voice services. Many networks still support voice in LTE using the CSFB functionality, i.e. falling back from LTE to 2G or 3G in order to establish the call. Having passed the lab proof-of-concept, operators are now moving voice over LTE (VoLTE) based on the IP multimedia subsystem (IMS) into a precommercial stage. This is a critical phase, since voice services still account for a large share of their revenues. Maintaining and improving quality levels of voice services is decisive in such a highly competitive market. 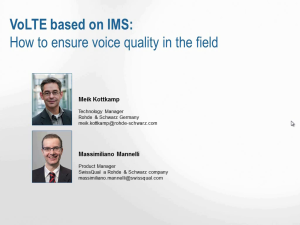 This webinar presents the technical background to VoLTE (based on IMS) and explains how to measure voice quality in live networks. It also illustrates the impact of radio conditions and IP impairments (e.g. jitter or audio delay) to audio quality. The main focus is on the field testing aspects of VoLTE. The capabilities for testing VoLTE in the lab will also be touched upon.